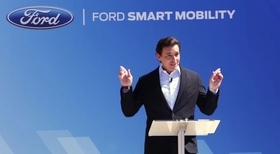 Ford Motor Co. CEO Mark Fields confirmed the long-expected move at an event attended by Wall Street analysts and investors, Wednesday. Ford Motor Co.'s confirmation Sept. 14 that it will move all of its U.S. small car production to Mexico comes as no surprise to Canadian parts manufacturers who supply the plant that builds the Ford Fusion and C-Max in Michigan. The announcement is old news to them, says the President of the Automobile Parts Manufacturers Association of Canada, Flavio Volpe. The development was “long telegraphed and not unexpected,” Volpe told Automotive News Canada. “Suppliers on these lines usually get an opportunity to re-bid the business if it’s been relocated,” and on the new product promised for the existing plant, he said. He said the Michigan Assembly Plan in Wayne, a suburb of Detroit, will get new, as yet unnamed products to compensate for the loss of the small vehicle production, likely larger and more profitable truck-based vehicles that are in high demand all across North America. The United Auto Workers, which represents the plant workers, signed a contract to that effect last year. Ford is building a new U.S. $1.6 billion assembly plant in San Luis Potosi, Mexico and is scheduled to begin producing the Fusion and C-Max there in 2018.